I don’t use words like “best-ever” lightly. It seems like just about every recipe on Pinterest is labeled that way – but with this one….I just can’t help it. This truly is the best chicken I’ve ever made. Ever. Let me be honest about something – I tend to over-cook chicken. I have a slight fear of making my family sick by serving undercooked chicken – and tend to go a little overboard with my cooking times. Even if you leave this chicken in the oven a little longer than normal – it still turns out JUICY. This chicken isn’t just juicy – it’s flavorful – and pairs well with a wide variety of side dishes. I was VERY skeptical when I first saw a version of this recipe. I hate Ranch dressing with a fiery passion. (I actually don’t eat any white condiments, unless they are cooked in something!) 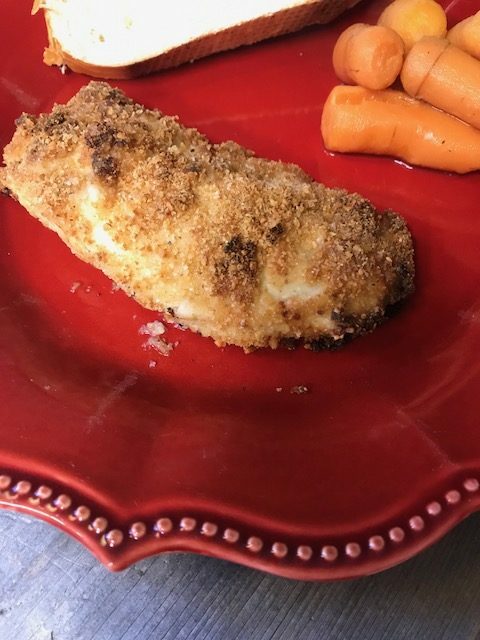 So, when I saw that this chicken was coated in something that makes me gag – I was certain I would hate it. And you guys – I love it. (And it’s cheap to make, easy to prepare, and a crowd-pleaser!) It’s perfect for a family meal and even good enough to serve to company. Start by getting two large dinner plates. Squirt your Ranch dressing onto one plate. On the second plate, dump your breadcrumbs, parmesan cheese, salt and pepper, and give it a good mix. Spray a 13×9 pan with cooking spray and set nearby your wet/dry breading plates. Dip each chicken breast into the Ranch dressing, making sure to coat both sides generously. Then, coat with the breadcrumb mixture, again making sure to coat both sides. 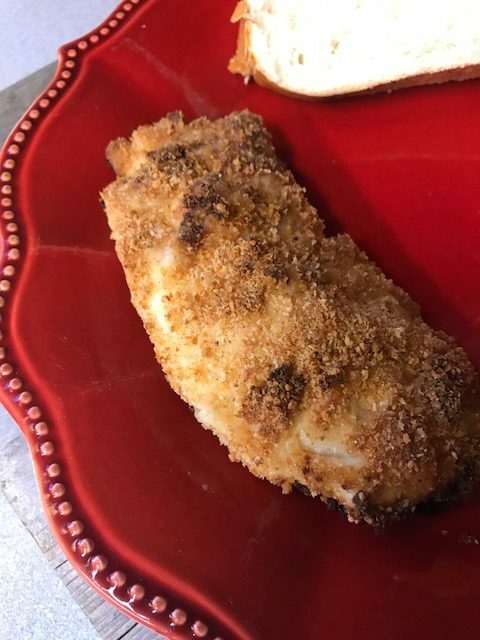 Place the breaded piece of chicken into the prepared 13×9 pan. Continue with each piece of chicken. Bake the chicken for approximately 30-35 minutes, or until the tops are golden brown and the center is cooked to 165 degrees. I always over cook chicken! I always think, just a little bit longer to be safe.